I also take advantage of deals that are offered through companies such as this. I follow Staples where they post up and coming sales at stores as well as online deals. Staples also has contests where you could enter to win prizes which brought me into Twitter in the first place a year ago. I have not done much social networking or client networking within this format. I could post finished projects that I have done to have a central source of URLs of launched websites as a sort of public portfolio. 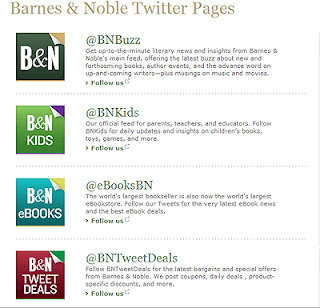 The Barnes and Noble twitter profile has a lot of various information to offer and is segmented into various demographics to allow its consumer market to easily and quickly find the resources they are looking for. They are also using their twitter profile as a source of advertising and marketing their products and resources such as the SAT preparation. They are using it as an expansion of their company to allow people to know more about what they have to offer and break it down so that their resources are tailored towards their target audience. I think that Barnes & Nobel is using this free tool to their advantage as well as the customers advantage. They are not only using it as advertisement, but as a way to offer other services and deals to their customers. By using this tool they are reaching not just one group of people like you would with say an e-mail listing. They are reaching out to all of the public which covers a wide group of people and not one specific. They are also reaching out to all types of audiences- parents, students, children etc. Not many companies can say that they have done the same. I was very happy to see that Barnes and Noble was using there twitter so effectively to reach out to customers and market their business so well.It was very nice to see that they not only advertised their entertainment, but also touched on education. The list of events is also very useful to promote peopel to come to their stores, which is especially good with so many e- books and cheap book sale sites such as amazon out there.